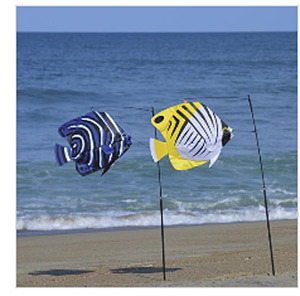 You will adore the animated swimming movements of these amazing items that are a cross between a weather vane, a windsock and a pet! Who would have thought a fish out of water could be so much fun! These wet wonders fill up with air, bob, weave and wag their tails just like a real fish! Made with fade resistant SunTex(TM) fabric and tough fiberglass hardware, our Swimming fish will make passers-by take notice.